In the 1470’s the wealthy Florentine art dealer Portinari, who maintained tight trade relations with Flanders, commissioned the renowned artist van der Goes of the Southern Netherlands to create an altar depicting the Adoration of the Shepherds. The altar would be placed in a Florentine church. This altar is one of the largest masterpieces of 15th-century art, as the central panel alone measures about three meters in width. Let’s take a closer look at the painting. The figures standing around Mary and the Child she is worshiping form a large circle, creating an excellent and well-organized composition. The details have been painted with great precision. 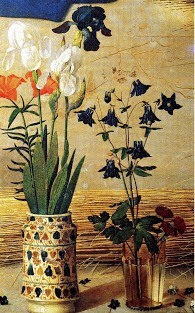 Notice, for example, the still life with flowers in the foreground. The scene looks so true to life that it makes one think the artist saw it with his own eyes. Actually, it is quite likely that he did see it, because during the fourteenth century this part of the biblical story was often dramatized in so-called ‘mystery plays’. During this same period (to focus for a moment on a very specific detail) there was a change in the way angels’ garments were depicted. Prior to this time they were usually dressed in a sort of timeless white cloth, but during the time of van der Goes they were more often dressed in heavy, brightly-coloured priestly clothes, richly embroidered in gold. It is almost certain that the theatre costumes of the mystery plays inspired them. Portrayals of the Adoration of the Shepherds first made their appearance in the 14th century. During that time and even before people began to consider and meditate on the details surrounding the life of Christ. Mysticism placed great value on this. In this connection the work of Psuedo-Bonaventura, a Franciscan from the late 13th century, is very important. His book Meditationes vitae Christi, which contains meditations on the life of Christ, did not deal with theological dogmas and treatises as was common in the scholarship of that day, but spoke to the heart. The author sketched the biblical scenes realistically and colourfully, inserting many details which are not included in the Gospel stories but come from the author’s imagination. The book contained many dialogues which lent themselves perfectly to adaptation for the stage and had a great influence on the poets who wrote the mystery plays. Pseudo-Bonaventura for example described Mary as leaning against a pillar just prior to giving birth. Consequently such a pillar makes its appearance in every depiction of the Birth of Christ and Adoration of the Shepherds and the Magi. It can also be found in this painting by van der Goes. According to legend the stable where Jesus was born was a remnant of the ruins of David’s palace in Bethlehem. It is a legend that likely emerged in an effort to explain the pillar that keeps cropping up in the Nativity scenes, though no one really remembered where it originated. The 15th-century depictions of the events surrounding Christ’s birth are thus strongly influenced by a mysticism which in turn strongly influenced the popular piety of the time. This moderately mystical thought world still lives on today. We find it, for example, in the idea which often comes up in Christmas songs that we should pray at Jesus’ cradle and kneel before the Child. When you look at this painting, you need no further support for the idea that such influences caused the artist to portray the story as he did. The fact that the people are dressed in the contemporary clothing of his day also supports this, even though 15th-century people did not yet have a modern understanding of history. For them anachronisms would not be troubling because they felt themselves to be part of the story. Apart from that one might ask oneself whether events really could have appeared like this. For example, would Mary really have knelt down in prayer before her child? The gospels record nothing about shepherds kneeling down beside the Christ child either. That is only said of the Magi, and the newer translations prefer to record that they ‘paid him homage’. I will leave it at this, even though I have said far too little about this absolutely gorgeous painting. 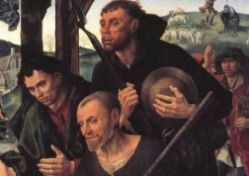 One could devote an entire article to the wonderful characterization in the faces of these shepherds alone! Hugo van der Goes: The Portinari Altarpiece, 1476-79, oil on wood, central panel: 253 x 304 cm, wings: 253 x 141 cm each. Galleria degli Uffizi, Florence. Hugo van der Goes (ca 1440-1482) was one of the most influential Northern European artists of the latter 15th century. Born c.1440 inGhent, Belgium little is known of his life story. He became a member of the painters’ guild of Ghent in 1467, repeatedly serving as its dean. He moved into the Red Cloister monastery near Brussels as a lay brother around 1478, presumably because he was suffering from attacks of mental illness. However, he did continue to paint. Characteristic of his work are his monumental figures. He died in Ghent in 1482. H.R. Rookmaaker (1922-1977) was a Dutch scholar, professor and author who wrote and lectured on art history, art theory, music, philosophy and Christianity. He grew up in the Dutch East Indies. As a young man in wartime Holland he was sent to a prisoner of war camp in Poland and became a Christian during that time. In 1948 a lifelong friendship with Francis Schaeffer began. In 1959 Rookmaaker published his doctoral thesis on the artist Gauguin and in 1965 he was invited to the Chair of Art History at the Free University of Amsterdam. Rookmaaker was also highly respected as a music critic. Originally published in Dutch in Calvinistisch Jongelingsblad 6, 34, 1951. Published in English in M. Hengelaar-Rookmaaker (ed. ): H.R. Rookmaaker: The Complete Works 4, Piquant – Carlisle, 2003. Also obtainable as a CD-Rom, seepiquanteditions.com/product_info.php and piquanteditions.com/product_info.php.